← Palestine: From a ‘will-be’ party to the CWC to a ‘would-have-been’? Anna Feigenbaum is an academic at the Centre for the Study of Journalism, Culture and Community, Bournemouth University. Her interest lies in data storytelling, an approach that benefits from increasing access to data to build a more complex narrative in support of social change. That narrative is furthermore interwoven with practitioners’ experience and empirical research. 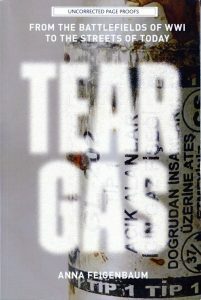 Her just published book Tear Gas: From the Battlefields of WW1 to the Streets of Today uses this approach to explain how a chemical warfare agent first used over a century ago has become a common weapon in the arsenals of police forces worldwide. This is the first time that I have been (consciously) exposed to this research and writing technique. The book makes for good and engaging reading: once picked up, it is difficult to put it aside. It is not a neutral piece of academic research (if such a thing exists): it is a campaign book that details the deception behind the so-called ‘non-lethal’ concept and decries the misuse of a poisonous agent in the name of law and order. Ever since the end of World War 1 policy makers and shapers have expressed their incomprehension about why their military could not use a toxic agent on the battlefield that the police can deploy against riotous crowds. Much rarer is the reverse question why politicians would ever consider equipping national police forces with a weapon of war for use against their electorate. In fact, it is so rare that I cannot recall ever having come across it. What cannot be denied is that riot control agents have been banned as an instrument of war since the 1925 Geneva Protocol. It is true that before the entry into force of the Chemical Weapons Convention (CWC) now 20 years ago this interpretation of the Geneva Protocol was contested by some, the United States in particular. But then the USA only signed up to the agreement in 1975 after it had come in for severe criticism for its widespread use of anti-plant agents (to deny communist forces jungle cover) and CS lachrymatory agent. This irritant saw widespread application in tunnel combat as well as a tool to separate civilians from North-Vietnamese irregulars who had infiltrated into towns and villages. Even today many Americans will argue with conviction that they did not wage chemical warfare in Indochina because the toxic substances were not lethal like sarin and mustard agent. Their position is not opportunistic: US military and politicians, and hence diplomats, already advanced this viewpoint after World War 1, during the Geneva Protocol negotiations and in the following years and decades. However, the debate if not introduced, then most certainly reinforced the idea that certain types of chemical weaponry can be classified as non-lethal. However, Paragraph 9 of the same Article excludes ‘Law enforcement including domestic riot control purposes’ [emphasis added] from the definition of a chemical weapon, which means that national police forces may deploy lachrymatory agents (other types of irritant agents also fall under this exclusion). On 28 August 1997 heavily armed troops of the North Atlantic Treaty Organization (NATO)-led Stabilization Force (SFOR) had to evacuate more than 40 officers of the International Police Task Force from the Bosnian Serb town of Brcko after clashes erupted between peacekeeping forces and civilians. In what was described as one of NATO’s worst confrontations in Bosnia and Herzegovina since the 1995 Dayton Agreement, US helicopters dropped tear-gas and soldiers fired warning shots to disperse the crowd. Another US unit used tear-gas in a second incident on 1 September after being attacked by about 250 people armed with sticks and stones near Bijeljina, a village close to Brcko. (c) peacekeeping operations in which force is authorized by the Security Council under Chapter VII of the UN Charter. The US Senate accepted the definition of a riot-control agent in Article II of the CWC but stated explicitly that the ‘President shall take no measure, and prescribe no rule or regulation, which would alter or eliminate Executive Order 11850’. (US Senate, Congressional Record, 24 April 1997, p. S3657). Fortunately, the United States has never exercised this reservation and through practice—no further incidents since the one in the Former Yugoslavia seem to have occurred—it has subscribed to the international consensus concerning riot control agents in armed conflict. In subsequent months and years states participating in UN-authorised missions have even declined to export lachrymatory agent to partner countries in peacekeeping operations in view of the CWC. In other words, the global consensus on the prohibition on the use of riot control agents in armed conflict is of rather recent origin. Domestic legitimacy of tear gas. Anna Feigenbaum does not discuss such international evolution of the interdiction or the role of tear gas in armed conflicts and peacekeeping operations. Her book focusses on the domestic dimensions of the weapon’s use. She crafts a historical narrative that easily segues from institutional and economic interests to major incidents of lachrymatory use in crowd control operations. The rise of institutional and economic interests in the manufacture of tear gas is tightly interwoven with the development of the non-lethal narrative as a powerful sales argument. The author deconstructs this sales pitch with science-based arguments: lethality is a function of circumstances. Concentration of the agent plays a big role: tear gas released in a closed room may easily kill its occupants if they cannot quickly make their escape. Infants and the infirm in particular are vulnerable to lachrymators. Even in open spaces the density of the particle cloud—tear gas is not really a gas—and the duration to which a person is exposed to it determine whether he or she will suffer nothing more than short irritation to the exposed parts, longer-lasting harm, permanent damage, or even death. Feigenbaum’s descriptions of riot control agent use illustrate graphically why exposure to the poison is not so harmless. Below is an extract from her book (pp. 80–81) describing the police intervention during the Democratic National Convention, which took place in Chicago between 26 and 29 August 1968. The United States was witnessing severe civil unrest fuelled by the protests against the war in Viêt-Nam and racial and social inequality. During the preceding months Martin Luther King, Jr and presidential candidate Robert F. Kennedy had been assassinated. The protesters were met with severe violence, in a number of cases leading to fatalities. On Monday night, protesters in Lincoln Park were prepared to resist eviction come curfew time. They assembled a makeshift barricade out of garbage cans and park benches. Hundreds of officers were on hand and equipped to stop the demonstration with force if necessary, periodically giving loudspeaker announcements for the remaining protesters to leave. An estimated thousand protesters remained. Some prepared for tear gas by smearing Vaseline on their faces and covering their mouths with wet clothes. Others held rocks and small projectiles to throw back at police lines. Trash fires burned along the barricade and occasionally a rock was hurled against a police-car window. Tear-gas canisters were plummeting everywhere behind the barricade, through the trees. A huge cloud of gas rolled over the barricade, and cops with gas masks came over the barricade in an assault wave, with shotguns and rifles and using the butts as clubs on anyone in sight. Gas! Gas! Gas! Was the cry, as if poisonous snakes had been loosed in the area … Thousands streamed across the park toward Clark Street, and panic started, headlong running, the sudden threat of being trampled by your own people … The tear gas was catching up with us, a sharp menthol sort of burning on the cheeks and burning in the eyes, but though some people ran from it, most of us kept on just walking … Now the tear gas began really burning, making the eyes twist tightly closed, and if you rubbed it the burning got worse, as if your eyeballs were being rolled in fire. Tear gas seeped into homes, cars, and restaurants. It covered whole city blocks, taking over the air. The following night, tear gas was once again used to clear demonstrators from the park at curfew. Historian Frank Kusch writes that a sanitation truck joined the police lines. “The bed of the truck held a tear gas dispenser and a large nozzle for dispensing the gas— all requisitioned from the army. Two police officers manned the nozzle.” Additional gas was fired into the remaining crowd as officers in gas masks forced protesters onto neighboring streets. Some fought back, throwing rocks and bottles. What emerges from this passage is that tear gas was not deployed to break up a protest but as an indiscriminate means to incapacitate crowds—irrespective of whether the individuals were rioters, accidental bystanders or professionals doing their work—so that the ability to resist other physical means of violence became as good as non-existent. Its use was indiscriminate, affecting even those who happened to live in the vicinity of the incidents. Of course, this particular incident in August 1968 took place long before the entry into force of the CWC. However, any person with the slightest interest in world affairs would over the past few years have seen footage and pictures of riot control agents being used against, for instance, regime opponents in Bahrain (2012), protestors in Turkey (2013), pro-democracy protestors in Hong Kong (2014), migrants entering Europe, or during the evacuation of the so-called ‘jungle’ just outside the French town of Calais (2016). How does this square with the aforementioned CWC’s delimitation of a riot control agent as an unscheduled chemical that can produce rapid sensory irritation or disabling physical effects, which disappear within a short time following termination of exposure? ♦ The application of riot control agents to ‘punish’ people for their behaviour or in situations when they are unable to escape the harmful properties of the riot control agent would be unlawful. ♦ A toxic agent intended for purposes not prohibited under the CWC is exempted from the definition of a chemical weapon as long as the types and quantities are consistent with such purposes (Article II, 1(a)). Finally, under Article III, 1(e) states parties must declare the riot control agent holdings. In particular it must notify the Technical Secretariat of the Organisation for the Prohibition of Chemical Weapons (OPCW) of the chemical name, structural formula and Chemical Abstracts Service (CAS) registry number, if assigned, of each chemical it holds for riot control purposes. In addition it must update this declaration not later than 30 days after any change becomes effective. In other words, international law exists that restricts the unbridled use of riot control agents even in domestic situations. Given that states parties must transpose the CWC obligations into domestic law, these restrictions should apply in any one of them. Or, as Anna Feigenbaum might phrase it, policing of the atmosphere is in breach of international and domestic law. Unfortunately, the issue is not high on the political agenda of the states parties even though the OPCW’s Scientific Advisory Board drew up a list of riot control agents for inclusion in the OPCW Chemical Agent Database (OCAD) in 2001 and considered the issue from the angle of the declaration obligation under Article III in March 2017. As already noted, the author did not aim to present a comprehensive tear gas biography. Having studied the history of chemical warfare for more than three decades now, one thing I appreciate very much is how she offers a wealth of additional background information and texture to the continuation of chemical warfare programmes after World War 1. It is generally well-known that after the Armistice efforts to constrain chemical warfare were hampered by the attempts by some victorious parties to secure the production secrets of the German chemical industry, which before the outbreak of hostilities had a virtual global monopoly in (synthetic) organic chemistry, including the commercially rewarding dye stuffs. The specialised military units created during the war for the chemical warfare, smoke and flame operations aligned themselves with those interests out of self-preservation. While they failed in expanding their responsibilities by having chemical weapons occupy a more central role in military doctrine, they were sufficiently successful to survive in a hostile public environment and to benefit from any surge in defence budgets. In her book, Feigenbaum details how those chemical warfare institutions—most notably the US Chemical Warfare Service—actively promoted the research and production of irritants in pursuit of those goals. The core tools in this strategy were the creation and nurturing of social networks, the organisation of technology transfers between the military and commercial industry and the development of communication strategies (e.g. the non-lethal argument) towards policy makers and the public. Veterans from those special units remained in contact with each other through fraternities and their employment in the chemical industry after demobilisation facilitated this military-industry exchange. One poignant sales pitch the military offered industrialists was the ‘humane’ breakup of industrial strikes. Tear gas offered an alternative to the police shooting strikers, so the argument went. The strategy was not a slam dunk, witness several congressional hearings. However, over the years evolving business models for risk and security increasingly influenced the public safety discourse. This knowledge about the deliberate pursuit of joint military-industrial interests and the resulting public debates furthermore contributes to the understanding why in the 1920s and 1930s resolving the conundrum of riot control agents took up such a central space in the framing of international norms against chemical warfare. Diplomats had already come to appreciate the dual-use potential of many commercial toxic chemicals. Preserving the legality of riot control agents in domestic law enforcement, while banning their use on the battlefields added an extra layer of complexity. Is it therefore not ironic that tear gas became a key factor in the formulation of the so-called ‘general purpose criterion’? The British draft disarmament treaty of 1933 contained its first iteration and today it is the cornerstone of the CWC. Indeed, law enforcement and domestic riot control is a purpose not prohibited under the convention. Another interesting angle developed in the book is how the UK adopted tear gas, first allowing it in the colonies, then in Northern Ireland, before authorising its use on the main island. It extends a longstanding historical pattern whereby use of poison weapons was prohibited against one’s own creed or other civilised peoples but entirely appropriate against indigenous people or in the colonies. Again Feigenbaum describes how interested parties, through their appointment in specialised review committees set the standards for security and safety, could influence the public discourse and create a demand for new agents and dissemination systems. Last year I reviewed Michael Crowley’s book Chemical Control: Regulation of Incapacitating Chemical Agent Weapons, Riot Control Agents and their Means of Delivery. I described it as a researcher’s data paradise offering highly technical and detailed information on the nature of riot control and incapacitating agents and their delivery systems, the research and development behind them, where they are being manufactured and how they are traded. However, this book is not for the novice. Anna Feigenbaum’s Tear Gas is the perfect introduction to the subject matter. It is well written and engaging. It does not lose the reader in technical details but builds a cogent narrative as to why riot control agents are problematic in current police operations. The book is not objective, nor is it comprehensive. It seeks to mobilise public consciousness about a matter that is almost daily fare on international news channels. She hereby draws on several years of preparatory research and her efforts to map the global use of tear gas. In 2014 I already drew attention to her work. The last chapter in Tear Gas introduces the reader to her project and updates its status. She focusses mainly on the United States and the United Kingdom, an outcome she attributes to her language limitations. In a certain sense, such country selection is also logical as the number of societies that release policy and technical documents for public consumption are rather limited. The data storytelling methodology may therefore reinforce this already pre-existing bias. Similarly, a question lingers as to how the methodology ascertains the comprehensiveness of collected information or is able to identify relevant gaps. I realise that my questions spring forth from a desire for comprehensiveness rather than from an explicit pursuit of social change. Notwithstanding, Feigenbaum has used the methodology to great effectiveness and in many ways has satisfied my eternal yearning for new insights and facts. Note: Anna Feigenbaum and I have occasionally corresponded with each other on the topic of riot control agents and chemical warfare in World War 1. She has quoted several contributors (including myself) to the book Innocence Slaughtered, which I edited. Otherwise I have no connection with her research project or publication.